Challenge: “Been there, done that…” Create truly exclusive experiences for group that has done it all! MFactor has worked with a high-end financial company for more than 10 years creating and executing their exclusive Platinum Partner incentive. This small group of their crème de la crème are hosted to an incentive each year that makes other company’s programs pale in comparison! Our challenge each year is to identify a unique destination and create experiences they could not even imagine! In 2015 the group’s program was in the Canadian Rockies. We wanted to make this a true once-in-a-lifetime experience and worked with a local DMC. We never “settle” for what has been done in the past and we blazed new trails with this adventure! Our vision was to take the group of 40 to an inaccessible mountain meadow for a gourmet picnic. Transport to the breathtaking site would need to be via helicopter and each ‘bird held just four people. After much discussion and hearing too many times, “It can’t be done,” we accomplished our goal and cemented a strong partnership with the local suppliers! Helicopters shuttled small groups to the meadow and, during this flightseeing ride, were treated to sites that had never been seen from so close and from above! Platinum Partners and guests enjoyed a culinary “picnic” unlike any other created accompanied by fine wines, microbrews and fine Scotch and whiskeys. This was truly what is meant as the experience of a lifetime! How to top that for their 2016 program? We recommended two-destination incentive to Rome and Florence which, of course, presents many opportunities for incredible experiences. But, again, rather than settle for what has been done in the past, we put our MFactor VIP touch on their Italian days. Our proposal to the client: “Imagine spending a day in Florence and a day in Rome with your own personal guide…someone with a passion for a specific and personal area of interest you have.” This is just what we created for one of our long-standing high-level, global companies. The history and culture of this region is rich and spectacular so we proposed “Your Day. Your Way.” Each attendee and guest would have a day expertly and personally designed just for them. During registration, each qualifier will work with a dedicated MFactor travel consultant to create a dream day in Rome and a dream day in Florence! Some possibilities are shown below but the options were limited only by the guests’ imaginations and passions! Art lovers would spend the day with a local art historian exploring masterpieces created by Michelangelo, da Vinci, Botticelli and many other Renaissance artisans. History lovers would walk in the footsteps of the rulers of the Roman Empire with personally guided visits to the Forum, the Coliseum and the Vatican or other venues. Sports car enthusiasts would cruise through the Italian countryside and visit the stately castles of Chianti behind the wheel of a Ferrari! Take to the air! 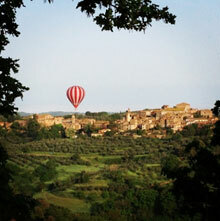 The heavenly countryside would be explored on a hot air balloon flight over the beautiful town of Sienna followed by a champagne brunch! 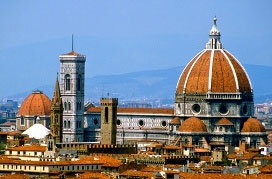 How about an exclusive day or half-day visit to Pisa, Lucca or San Gimignano? Adventurers would experience the excitement and “rush” of the streets of Rome with a guided tour on vintage Vespas or from the comfort of a vintage automobile. Buon appetito! A customized hands-on Italian cooking class at the Cordon Bleu Cooking School with Chef Gabriella Mar is just the ticket for those who like to mix it up in the kitchen! Calling all fashionistas! Plunge into the world of top fashion designers! Led by a professional shopper, the day would provide behind-the-scenes glimpses into the world of haute couture with private tours at the Museo Gucci and Museo Ferragamo. This type of concierge program is unique to this client with their elite and small group; not every client has such sizeable budgets. MFactor loves the challenge of dreaming up and delivering truly distinctive experiences such as this… a chance to be immersed in a facet of Roman and Florentine life in a way that is enjoyed by a rare few. MFactor shines with providing very personal, one-on-one creation of Your Day. Your Way. From history to architecture to art to cooking to shopping…we will make it happen for the client’s best with exclusive experiences befitting their highest achievers!